Wiz Khalifa’s Weed Farm has all the ingredients for what should be, at least, a funny distraction. In practice, it’s really boring, but for the people who celebrate the holiday on which it was released that might not matter. It’s April 20th and Wiz Khalifa—rapper, marijuana enthusiast and Amber Rose’s baby daddy—has released a mobile game about growing weed. Khalifa is an avid and vocal consumer of cannabis, and this is maybe not the first time he has combined weed and video games. At least year’s E3, Khalifa told an interviewer that he had a secret weapon and said, “It’s the bomb, and that’s the only thing I can let you know. Zac Efron and Jamie Foxx then told the same interviewer that they were going to find Khalifa to “make this day go smooth.” All three of them then played Battlefield 1 with distant, dazed stares. All the charm and personality in the above anecdote is missing from Wiz Khalifa’s Weed Farm. Even the title is nondescript. In this game, you grow weed, possibly for Khalifa, or maybe just for the pursuit of growing weed. There is no selling or smoking weed in the game, just endless, monotonous growing in an effort to maximize your profits. You tap a plot of land in order to plant a strain of marijuana, you tap the plant after a certain amount of time has passed in order to collect coins, you use those coins to plant more strains, rinse, repeat. It is the same exact formula you have seen in mobile games since their inception. It’s not even particularly Khalifa themed. While his puckish grin graces the screen, there’s not much personality here. There are many, many opportunities to watch ads to double or triple your profits, and one of them is the option to “drop a beat.” I thought, oh, would I perhaps hear a snippet of Snoop Dogg and Khalifa’s hit song, “Young and Wild and Free?” No. The beat that is dropped sounds like it was downloaded from a free beats MySpace in 2001. 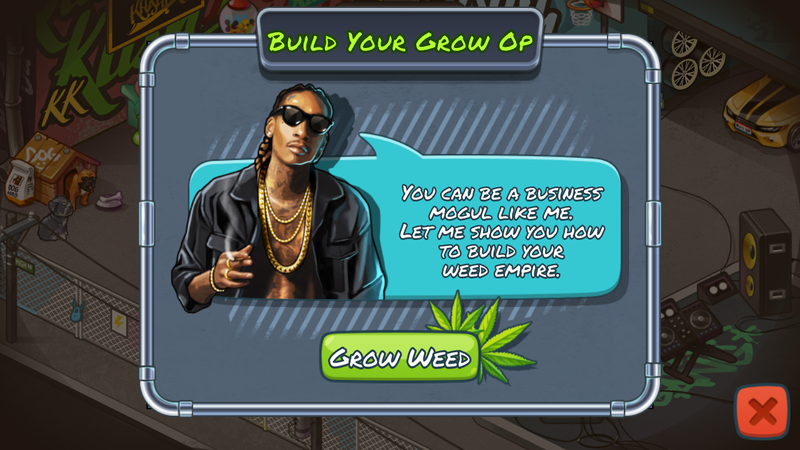 Compared to Glu’s celebrity sponsored games like Britney Spears: American Dream or Kim Kardashian: Hollywood, Wiz Khalifa’s Weed Farm is a disappointment. The game has reached its target audience. They will be fine. Godspeed to you, Wiz Khalifa.